I never noticed before just how many markets are opened at this time of the year, whether it be food, antiques, clothes, or just any other nicknacks. 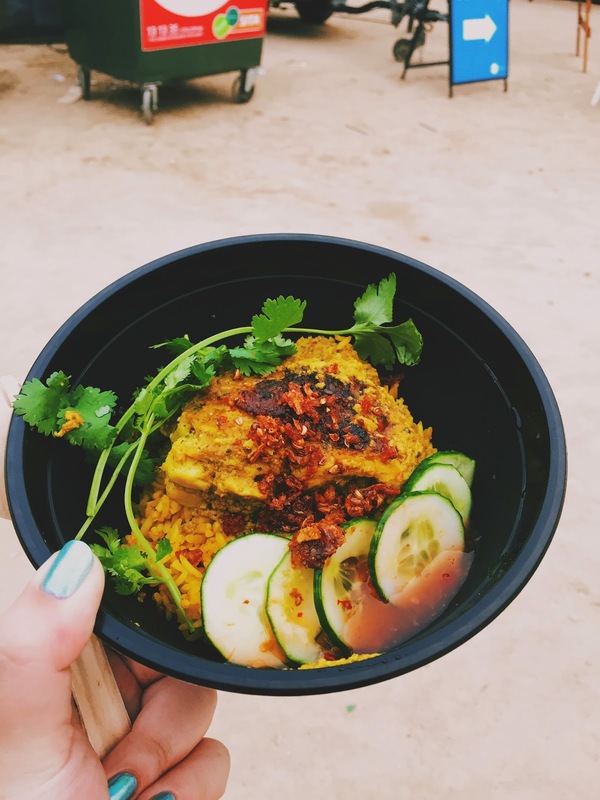 The Night Noodle Market is another food event of The Age Good Food Month that was introduced last year, and in 2014, it’s brought back to us in a brand new location, with over 50 food stalls and food trucks. I actually missed out on the Night Noodle Market last year, because I was volunteering overseas, so this year, I was all like MUST NOT MISS OUT AGAIN LOL. This was super duper disappointing. I’ve actually never visited Longrain myself, but I have heard great things about it, which might be why my expectations were so high for this dish. It was rather bland, and did not leave a strong impression on me. The chicken was a bit dry, the rice was a little undercooked, the cucumbers were just your average sliced cucumbers, and the ‘relish’ didn’t bring much to the dish either, actually it just tasted like fish sauce to me. 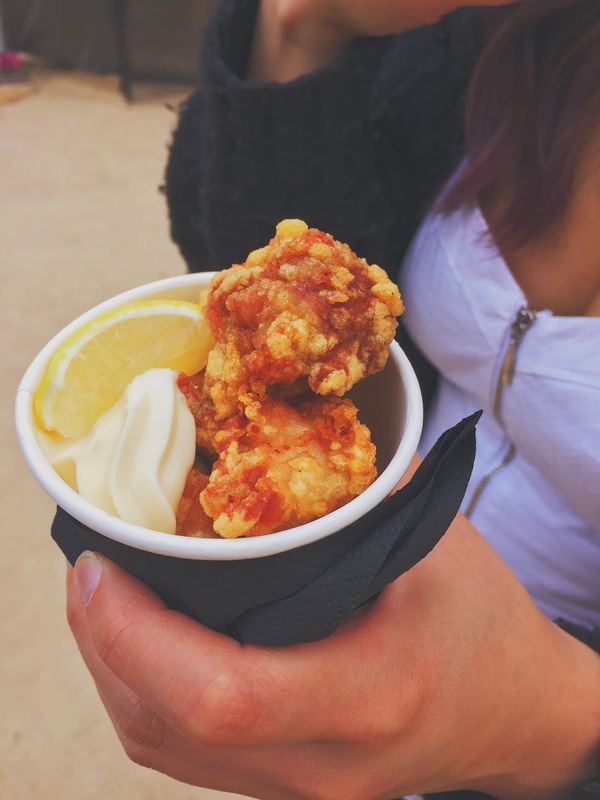 There were 341982312765134 stalls/trucks selling fried chicken, and we chose the ones from Izakaya Den to start things off. The popcorn sized chicken were piping hot, straight from the deep fryer I’m assuming. Crispy on the outside, and juicy on the inside, what more do you need? It was served with regular mayo rather than kewpie, which I think made all the difference, but oh well, I was already satisfied. More fried chicken because why the hell not? MFC was all over instagram according to my friend, so we had to join the hype. Garlic, amongst other herbs, was the strongest flavour I could taste from the crispy batter, and it tasted divine. 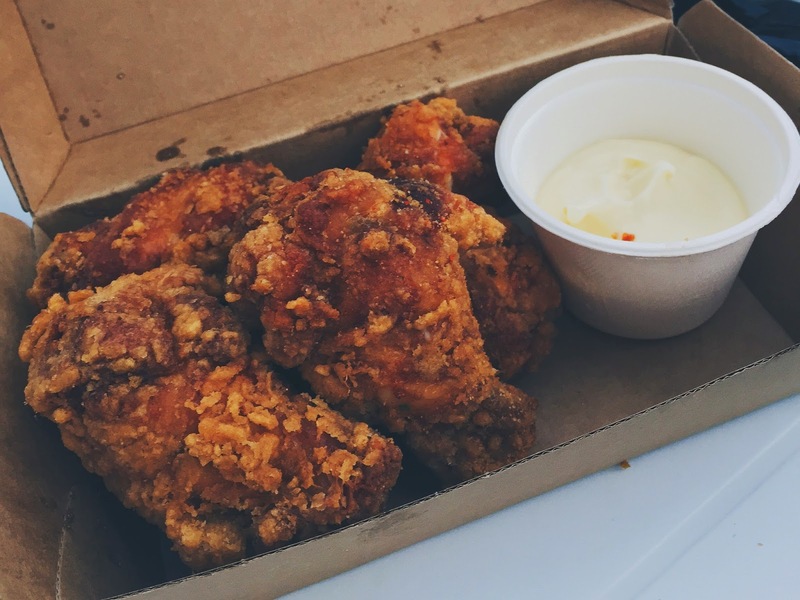 My friend claimed this to be the best fried chicken she’s had, I’m yet to try a couple more restaurants out, so I don’t want to say anything too early, but yes, they were pretty amazing. The two pieces on the top were the biggest, and they got pretty tiny towards the bottom, that’s just what’s expected from these types of places I guess haha. Again, mayo instead of kewpie, but these tasty chicken drumettes did not need any accompaniment, except maybe a cold beer (YWCFTS reference DUH). This is seriously what turned my night upside down. No, I am not exaggerating. 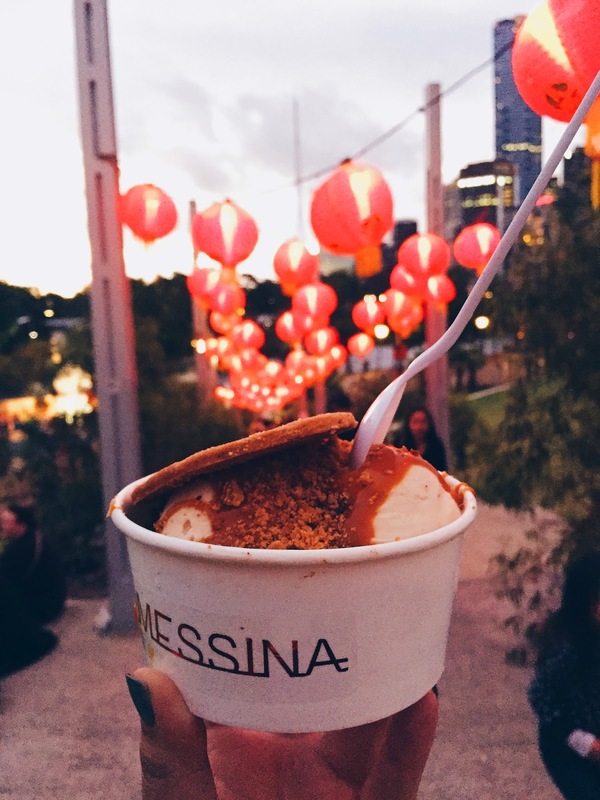 Messina was what I looked forward to the most at the Noodle Market. After they finally opened up a store on Smith Street, I have been there on numerous occasions, and it never failed to disappoint. Don’t get me wrong, the peanut gelato was amazing, the components all worked pretty well together, albeit a bit sweet, but that’s nothing I can’t handle. The biggest let down was the brownie, which was at the bottom of the gelato. Now, I’m no expert on physics, but I’m going to take a wild guess and say that the coldness of the gelato and the warmth of the brownie did not work well together, and made the brownie stuck the container. And by stuck, I mean stuck, for reals. Maybe if I had a knife I would be able to cut through the brownie, but all I was given was an useless plastic spoon. So yeh, it was a traumatising experience to say the least. Under normal circumstances, I would not have gone for these skewers, not because they didn’t look delicious, but I already tried the things I had my eyes on, and would be happy to call it a night. However, the disaster at Messina left me feeling a little sad, and I needed these skewers to cheer me up. 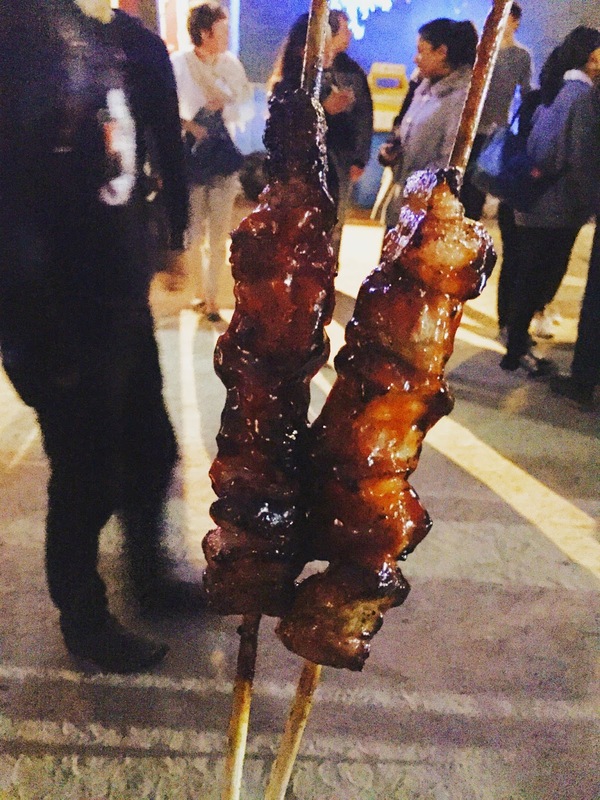 Hoy Pinoy had a stall at the Queen Victoria Night Market too, but they didn’t have these skewers. 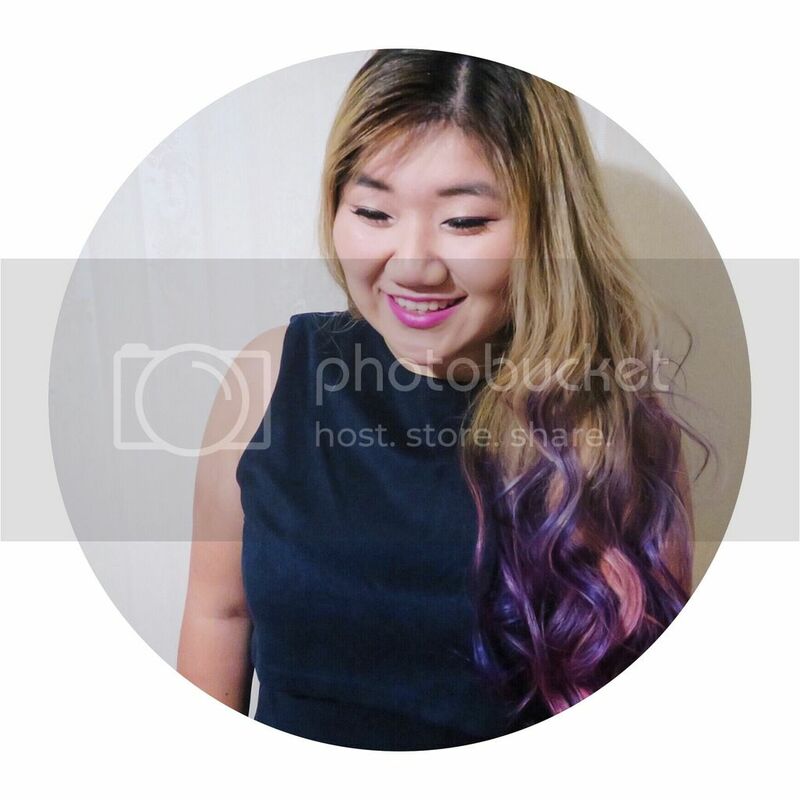 They tasted exactly how I imagined them to – the fat oozing out of the smoky pork belly, the banana ketchup glaze taking the whole thing to the next level. Needless to say, this led to the happy ending of my night. One thing though, they were lukewarm, possibly due to the long queue, and so they had to makes heaps in advance, the skewers are perfect otherwise. 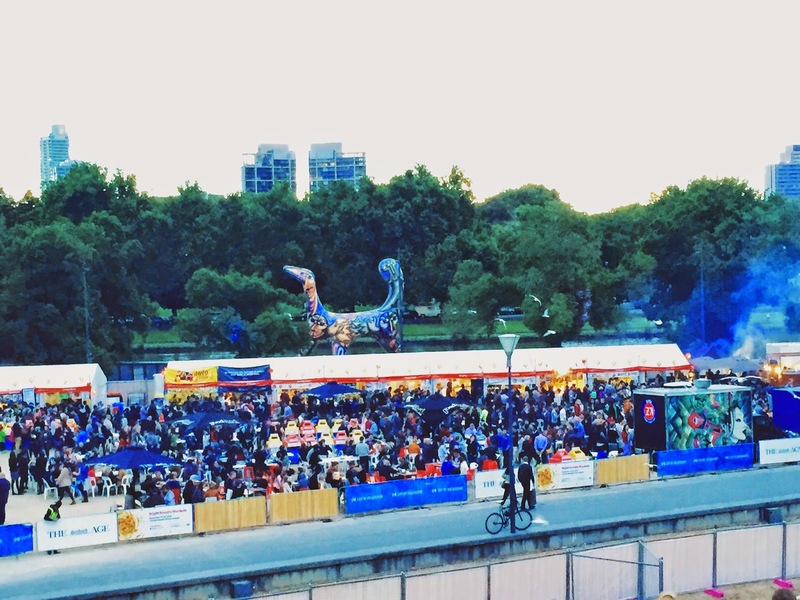 The Night Noodle Market is actually finishing this Sunday, so get in quick! It’s open 4pm-10pm on Saturday, and 4pm-9pm on Sunday! 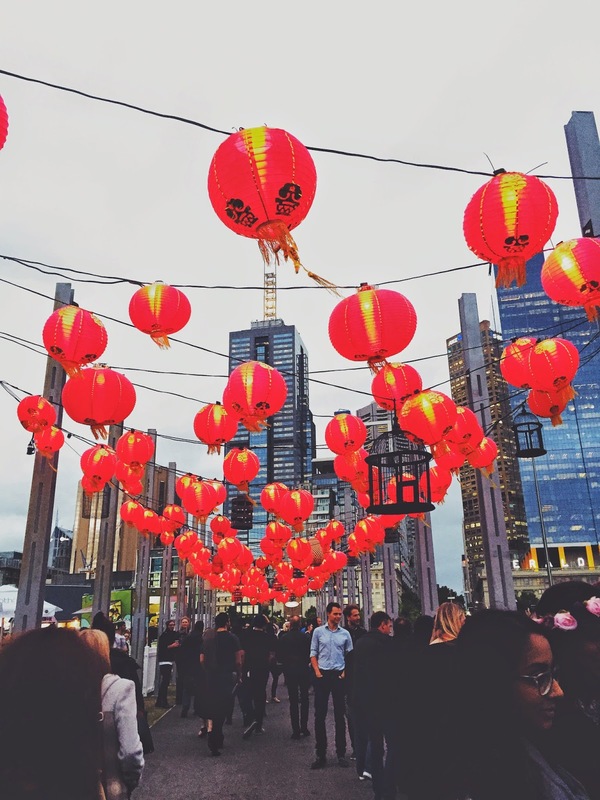 The Night Noodle Market is located in Birrarung Marr this year, which is a short 5 minutes walk from Federation Square.